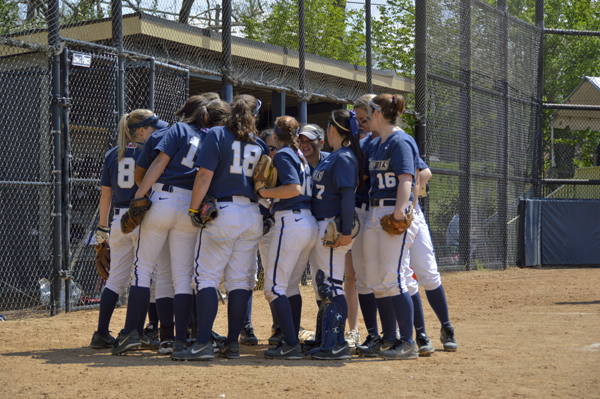 The softball team huddles up before a game against St. Bonaventure in April. The Colonials beat the Bonnies 8-0. In a season that saw a 12-game win streak and program-record 27 wins, the once-sizzling Colonials finished their year with a whimper Thursday. In a rematch of its first-round loss, GW fell 8-3 in an elimination game to Saint Louis, ending its Atlantic 10 tournament run on just the second day. It was the kind of near-miss that has defined GW’s past week, which also saw the team surrender its top seed in the tournament after losing last weekend’s final regular season series. The game marked the Colonials’ fifth loss in their last six games played. Junior Courtney Martin started the game and pitched three innings giving up four runs, three earned, on four hits, while striking out three Billikens’ hitters. Freshman Meghan Rico replaced Martin in the fourth and finished the game, giving up four more runs for the Colonials. With the Colonials threatening a big offensive inning in the fifth, Billikens head coach Christy Connoyer handed the ball off to Brianna Lore, who earned the win against the Colonials in Wednesday’s game. Lore was able to contain the Colonials, inducing only two RBI groundouts by senior Tara Fogarty and sophomore Victoria Valos. By inning’s end, the Colonials were only able to cut the lead to two, now trailing 5-3. But it was all Saint Louis from that point on, as they tacked on three insurance runs in the top of the seventh, cementing their 8-3 victory and sending the Colonials packing. GW simply had no answer for a hot Billikens’ ball club who saw eight out of its nine starting players have at least one hit. On the flip side, the first five hitters in the Colonials’ lineup struggled mightily against Billiken pitching, going a combined 1-14 on the day. The Colonials finish the individual accomplishment heavy season with a record of 27-23.